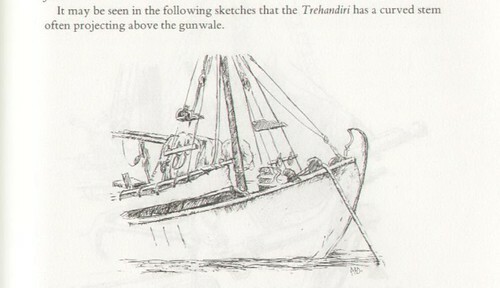 Furthering my interest in local craft (For love of a boat), I have been researching Greek inshore fishing boats. I contacted the library at the National Maritime Museum Cornwall and Denise Davey, one of the library volunteers, took up my request and was extremely helpful. She came back with scanned copies of one of the appendices to H.R.Denham’s “The Aegean” – Inshore Craft. Here is one of the illustrations. You will instantly recognise the hull shape from images in earlier posts to this blog. This and more arrived earlier this week. I am very grateful to the NMMC. I had not heard of Denham’s book. I wondered when it was written, meaning to look it up on Google. This evening I have been reading Hammond Innes’ “Sea and Islands”. published in 1967. Hammond Innes was one of the earliest authors I read – well before James Bond. In retrospect, I found his stories far more exciting, if less fashionable, than Ian Fleming’s. The book was hidden on a shelf in my favourite used-book shop – Books by the Sea in Bude, Cornwall. Apart from the author and the subject, I was bowled over by the dated dust jacket. A whole different era. 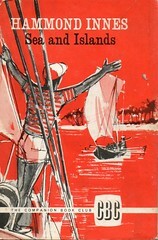 In “Sea and Islands”, Innes describes various voyages in his Robert Clark designed, 42 foot, masthead cruiser-racer ‘Mary Deare’. He describes being dismasted in the RORC’s North Sea Race; a cruise ‘rockhopping’ in Scandinavia and then taking the boat to the Mediterranean and exploring the Greek Islands. It is when he starts to describe the islands and the sea between them that the book comes alive. I am only half way through the book but the islands themselves have brought life to it. So now I know. I must get hold of a copy.